The Ministerial Committee tasked to consider the future of 38, Oxley Road has laid out three broad options for the house, but left the final decision on it to a future government. • allow it to be fully demolished for redevelopment, either by the property owner or the state. Deputy Prime Minister Teo Chee Hean, who chaired the four-member panel, said it did not make any recommendations as no decision is required now. Mr Lee's daughter Lee Wei Ling has said she intends to continue living in the house. DPM Teo said: "Ultimately, in the fullness of time, a future government will have the responsibility to consider the public interest aspects of the property, taking into account Mr Lee's wishes. They will have to decide what to do with the property and be able to carry the decision." The committee assessed that the house - where the People's Action Party was founded - has architectural, heritage and historical significance. It also concluded that the late Mr Lee's preference was for his house to be demolished after his death, based on evidence that included statements he had made. However, the late Mr Lee was also prepared to accept options other than demolition, the committee said, citing documents such as his Dec 27, 2011 letter to the Cabinet saying that if the house were to be preserved, it should be refurbished and let out for people to live in. Responding to the report, Prime Minister Lee Hsien Loong wrote on Facebook: "Speaking as a son, I accept the committee's conclusion on what my father's wishes were regarding the house at 38, Oxley Road, and the range of options it has laid out." He noted that he had recused himself from discussions on his father's property, and expressed his hope that when the time comes, the report will help the government of the day "make an informed decision that both respects my father's wishes and is in the public interest". When reached at his home in Caldecottt Close, the PM's younger brother Lee Hsien Yang declined comment. Dr Lee, when contacted on the phone, said she has nothing to say at the moment. The fate of 38, Oxley Road was thrust into the public spotlight in June last year when the duo accused PM Lee of misusing his power in a bid to preserve their late father's house. They alleged that he was doing it for political gain. Among other things, they accused PM Lee of using his position to influence the ministerial panel into challenging the validity of a clause to demolish the house in Mr Lee's final will. The public falling-out stunned the country. PM Lee later apologised for the grief it caused, and delivered a statement in Parliament to refute their accusations. 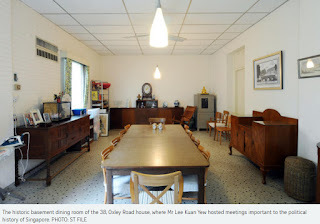 The committee yesterday said it is possible to preserve 38, Oxley Road in its entirety. On the other end of the spectrum, it could be fully demolished and turned into a public space or redeveloped into a five-storey residential building. The last option though, said the panel, "would result in the loss of a historically significant property", and possibly allow the historical site to be leveraged for profit. It also detailed possible "intermediate" options that include preserving just the basement dining room and integrating it with a park or heritage centre. Such plans would be compatible with Mr Lee's wishes and still retain the heritage value of the site for future generations, said the committee. DPM Teo said yesterday that the committee felt it owed it to Singaporeans to release its findings, as the dispute over 38, Oxley Road had thrust its work into the spotlight. He added: "With this, we hope to close the chapter on this topic, and focus on other pressing national issues ahead of us." Could founding prime minister Lee Kuan Yew's old home one day house a museum or think-tank? Alternatively, the house could be razed and a public park built there. Or, perhaps, a five-storey residential development of 16 units could rise from where the one-storey bungalow now stands. The Ministerial Committee tasked to consider the future of 38, Oxley Road threw up these possibilities as among the options that a future government could consider. It was released alongside a separate report by the National Heritage Board (NHB), detailing the historic and architectural significance of the property. The NHB said the house is associated with key events in Singapore's history, and is a rare and unique type of bungalow from an architectural perspective. In its report released yesterday, the ministerial panel sketched out three broad options for the house. The first involves retaining the house. This could take the form of gazetting it as a national monument to accord it the highest level of protection. The state has to acquire the property and rezone the site. It could be turned into a civic and community site or house an educational institute associated with Mr Lee's legacy, like an LKY School of Public Policy think-tank or LKY World City Prize research centre, suggested the committee. Restrictions on access could be placed on the house, to take into account the late Mr Lee's wish to protect the family's privacy, it added. Another way to retain the property would be to gazette it for conservation, which would protect the building itself and the basement dining room where the People's Action Party was founded, said the panel. Doing so would allow greater flexibility for modifications and refurbishment of its interior, which would "significantly address" the late Mr Lee's concerns about privacy, it added. On the other end, said the committee, the property could be demolished and redeveloped, either by the state for alternative uses such as a public park or heritage centre - "one way to allow public access to the site" - or by the owner for residential use. The house is currently owned by Mr Lee Hsien Yang. The committee noted that the Urban Redevelopment Authority has assessed that the site can be rezoned to allow for a five-storey residential development. This means it can yield about 16 units. However, this option "would result in the loss of a historically significant property" and possibly allow it to be leveraged for profit, it said. There are also intermediate options which would be compatible with the late Mr Lee's wishes and retain the site's heritage value for future generations, it said. The basement dining room - the most historically significant part of the property - could be gazetted as a national monument, while the rest of the house is demolished. This is one way to fulfil the founding prime minister's wishes, it said, while adding that there may be a loss of context in preserving a room alone without the rest of the house. The committee said the retained basement dining room could be housed in a glass house or garden room for guided viewing as part of a park, given that Mr Lee was a strong advocate for the greening of Singapore. Another possibility would be to incorporate the dining room into a new building which could be used as a research or heritage centre. This would allow public access to the dining room for the purposes of national education, while not revealing details about the late Mr and Mrs Lee's way of life , it said. 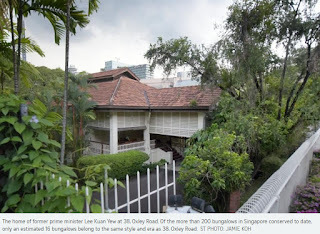 The Ministerial Committee studying options for 38, Oxley Road concluded that the late Mr Lee Kuan Yew preferred the house to be demolished. However, it also noted in its report released yesterday that the founding prime minister was aware that Cabinet ministers and others were opposed to demolition, given the property's historical and heritage value, as well as their reading of public sentiments. In view of this, the late Mr Lee was prepared to accept other options besides demolition, the committee said - provided the property was refurbished and kept in a habitable state, and the family's privacy was protected. 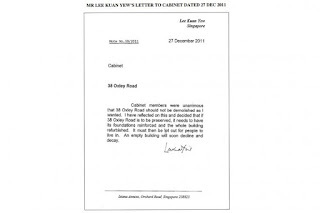 • Mr Lee's letter to the Cabinet in December 2011. • The renovation/redevelopment plans for the property which he submitted to the Urban Redevelopment Authority (URA) in March 2012. • The demolition clause in his last will in December 2013. Mr Lee wrote a letter to the Cabinet on Dec 27, following a meeting in July where he had presented his views about the property and listened to the views of some Cabinet members. 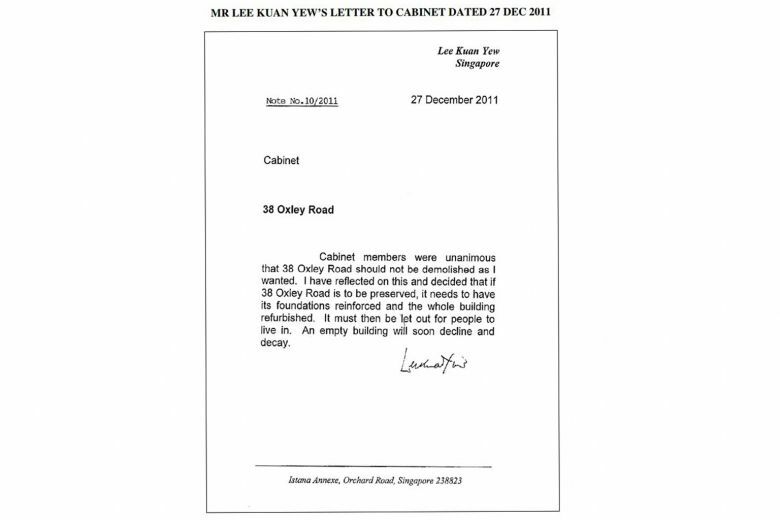 This letter acknowledged that Cabinet members were unanimous that 38, Oxley Road should not be demolished. Mr Lee wrote: "I have reflected on this and decided that if 38, Oxley Road is to be preserved, it needs to have its foundations reinforced and the whole building refurbished. It must then be let out for people to live in. An empty building will soon decline and decay." This was Mr Lee's last formal communication to the Cabinet on the property, and was written less than a week after he executed his second will on Dec 21, 2011, which also includes the demolition clause. The Ministerial Committee noted that this letter acknowledged that the property may be preserved, and set out Mr Lee's views on what he wanted if that were to happen. In January 2012, Mr Lee approved detailed plans to overhaul the interior living areas entirely while retaining the external structure and the basement dining room. The Ministerial Committee said an e-mail sent by Madam Ho Ching to the rest of the family on Jan 2, which set out the plans in detail, suggested these had been specifically prepared with conservation requirements in mind. In the e-mail, Madam Ho said the architect she had consulted, at Mr Lee Hsien Yang's introduction, had explained that "conservation requirements typically do not mean preserving the house in its entirety - the interior layouts are often changed to reflect new family usage needs". The detailed architectural plans were then approved by Mr Lee for submission to the URA in March 2012. He subsequently affirmed them after URA gave its approval, the committee said. On April 30, Madam Ho updated the family on the approval and asked if Mr Lee needed her to follow up on anything else, to which he said "no", and confirmed that "permission has been granted as I had previously signed in letters to (the URA)". On May 15, Madam Ho recommended that they work through the structural and other design details for the renovation/redevelopment plan. She volunteered to work with the architect and design team as Mr Lee's representative. Mr Lee replied: "Noted. Proceed." The demolition clause in Mr Lee's last will comprised two parts, the committee noted. The first part states his wish that the house at 38, Oxley Road be demolished immediately after his death or, if his daughter Lee Wei Ling would prefer to keep living there, immediately after she moves out. The second part then specifies his wishes in the event demolition was not possible, it said. "If our children are unable to demolish the house as a result of any changes in the law, rules or regulations binding them, it is my wish that the house never be opened to others except my children, their families and descendants." The committee noted this clause acknowledged the possibility that demolition may not take place, and clarified how he did not want the house to be open to the public, if so. This clause was also included in several earlier versions of the will. It appeared in the first four of Mr Lee's seven wills made from Aug 20, 2011, onwards, but was removed on the late Mr Lee's instruction from the fifth and sixth wills. It was re-inserted in the final will made on Dec 17, 2013. The committee noted that questions had been raised concerning the preparation of Mr Lee's last will, but said it did not find it was necessary to set out its views on these questions for the purposes of the report. "Our interest is confined to obtaining as full a picture as possible of Mr Lee's thinking and wishes on the property, and to try and determine this as best as we can," it said. Mr Lee Hsien Yang and his sister Lee Wei Ling have taken issue with the report by the Ministerial Committee on 38, Oxley Road, saying that it does not accurately represent the wishes of founding prime minister Lee Kuan Yew. In a statement posted on Facebook yesterday, the younger Mr Lee said the committee pointed to certain statements made by the late Mr Lee Kuan Yew as evidence that he was prepared to accept options other than demolition of his house. "That claim is misleading," said Mr Lee Hsien Yang. "In context, it is clear that our father was not endorsing alternatives to demolition, but was forced to consider them because of Loong's and Ho Ching's insistence that the Government would not respect our father's dying wish," he added, referring to his older brother, Prime Minister Lee Hsien Loong, and sister-in-law Ho Ching. He maintained that the late Mr Lee Kuan Yew never accepted these alternatives, and merely set out what he wanted if the Government prevented his house from being demolished. In a separate Facebook post, Mr Lee Kuan Yew's daughter Lee Wei Ling said her father was as direct as her, and had made absolutely clear what he wanted done with the house. "He and Mama had long decided they wanted it demolished after they were gone," Dr Lee wrote. "It would require unbelievable lack of intelligence or determined denial to not understand what Pa and Ma so unambiguously wanted. It seems to me my big brother and his committee have achieved that distinction with amazing ease." The siblings were responding to the report released on Monday by the panel, chaired by Deputy Prime Minister Teo Chee Hean. The panel had set out three broad options for the house for a future government to consider - preserve it entirely, retain only the basement dining room and demolish the rest of the property, or demolish the property entirely. Last evening, the committee issued a statement noting the statements by the Lee siblings. It said it had already "carefully weighed" the views expressed by the siblings, together with submissions from the parties in their personal capacities. It reiterated that the options "are meant to help a future government make an informed and considered decision when the need arises". It added that it relied on three key objective documents from Mr Lee Kuan Yew which "gave concrete expression to his thinking and wishes regarding the property" - his letter to the Cabinet in December 2011, redevelopment plans which he submitted to the Urban Redevelopment Authority (URA) in March 2012, and the demolition clause in his last will in December 2013. Disputing the committee's conclusion, Mr Lee Hsien Yang said his late father wanted demolition "unwaveringly". He cited an e-mail by his father to his children on Oct 3, 2011, in which Mr Lee Kuan Yew said that "Loong as PM has indicated that he will declare it a heritage site". Wrote Mr Lee Hsien Yang: "In light of this false impression given by Loong, Lee Kuan Yew was forced to consider options other than demolition." On the renovation plans submitted to the URA in 2012, he said: "Our father reluctantly went along only because he believed the Government already intended to thwart his hopes." In its report, the committee noted that Mr Lee Kuan Yew had approved detailed plans to entirely overhaul the interior living areas while retaining the external structure and basement dining room. It stated how PM Lee's wife, Madam Ho, had sent an e-mail on Jan 2, 2012 to Mr Lee Kuan Yew and the rest of the family about the plans. A day later, Mr Lee Kuan Yew told Madam Ho via e-mail: "I have confidence in your judgment. Do what gives you maximum opportunities for later use." Mr Lee Hsien Yang also cited how his father had said in his last will that "if our children are unable to demolish the house as a result of any changes in the law, rules or regulations binding them, it is my wish that the house never be opened to others except my children, their families and descendants". The alternative options set out by the committee violate what Mr Lee Kuan Yew wanted if the house were not demolished, he said. He also claimed that the committee had "relied extensively" on submissions by PM Lee, "even though he claimed to recuse himself from any discussions on 38, Oxley Road". The last will - which was granted probate in October 2015 - is the full, final and legally binding statement of the late Mr Lee Kuan Yew's wishes for the house, Mr Lee Hsien Yang said. "Combined with Lee Kuan Yew's numerous and unwavering public statements on the matter, there is more than enough documentary evidence for a future government to understand - and hopefully grant - our father's last wish," he added. Noting these rejoinders from the two Lee siblings, the committee said in response that their statements will be lodged with the Cabinet Secretary for a future government to refer to. 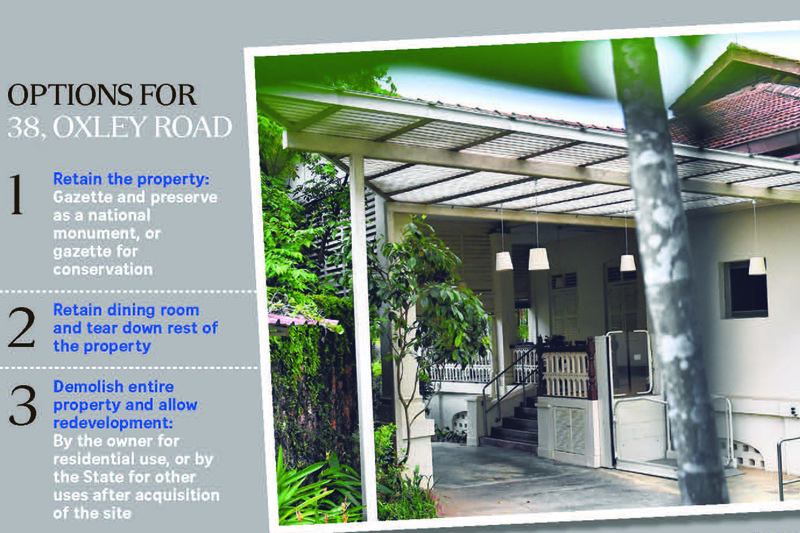 Heritage and history experts are generally in favour of preserving 38, Oxley Road given its historical significance. But they are split on whether the "intermediate" option proposed by the Ministerial Committee - to preserve just the basement dining room and tear down the rest of the property - is ideal. The other two options it suggested are to retain the property in its entirety, or to demolish it. Yesterday, Singapore University of Technology and Design architecture professor Yeo Kang Shua and ISEAS -Yusof Ishak Institute sociologist Terence Chong told The Straits Times that preserving just the basement "would be a 'neither here nor there' approach". In a joint response, they explained that there are two main considerations when it comes to the heritage status of founding prime minister Lee Kuan Yew's house. The first is its architectural merit, and the second is its role as a site of many political decisions and events. "We also believe that historical meanings are intertwined with tangible spaces. In this case, both considerations above cannot be properly respected with option 2 as it would decontextualise the dining room from the house," they said, referring to the suggestion of retaining just the dining room. Thus, they said, they prefer the option of retaining the property, followed by the option of demolition. Yale-NUS historian Tan Tai Yong said, however, that as someone who thinks that it is important to have physical markers of the country's historical evolution, he feels "it is necessary to preserve the house, if not fully then at least a carefully chosen portion that has actual historical significance". Meanwhile, he added, the outright demolition of 38, Oxley Road would deprive the country of a significant historical landmark. "Hopefully, when the time comes for the government of the day to make a decision, an arrangement could be found that will serve to honour, on the one hand, the sentiments of the family and, on the other, the legacy of the State." National University of Singapore architecture professor Johannes Widodo said that ideally, the best way to find the best option is through national consensus, perhaps by setting up a national trust. This would operate as a non-profit organisation that dedicates itself to preserving the cultural and natural heritage of a country and could become a "middle platform" to mediate various interests, looking for consensus and mobilising resources, he said. Whichever of the three options the government of the day eventually chooses in future, due process needs to be followed, said the experts. Dr Kevin Tan, president of the International Council on Monuments and Sites Singapore, said: "Anyone can make a will, asking their descendants to have their property demolished when they are dead. That is a personal prerogative, but an individual's will can never override wider State interests." So, the State is empowered to order the preservation of 38, Oxley Road but to do so legally, it will probably have to acquire the property and pay the owner market rate and put it to use for a public purpose, he said. Only an estimated 16 bungalows - of the more than 200 in Singapore conserved to date - belong to the same style and era as 38, Oxley Road, said the National Heritage Board (NHB). That detail was among various findings in a 31-page research report by the NHB on the historical and architectural significance of founding prime minister Lee Kuan Yew's house, released yesterday. The bungalow, whose architectural roots date back to 18th century colonial India, has distinctive, rare and well-preserved features, said the report. The Lees moved into the house after the war, in 1945 or 1946, renting it until 1965, when they bought it in order to make changes to enhance its security. Built around 1898, the house was commissioned by Dutch merchant Hermann Cornelius Verloop. The Oxley Road area was a middle-class European area, until the Japanese took over the houses during the Japanese Occupation. The house is associated with key events in the nation's history, said the report. Mr Lee held meetings there with Chinese-educated unionists Fong Swee Suan and Lim Chin Siong. The house was also where Mr Lee, a lawyer, got to know students from the Chinese Middle School, who asked him to defend their friends arrested for rioting in 1954. Individuals like Dr Goh Keng Swee and Dr Toh Chin Chye also joined Mr Lim and Mr Fong in secret discussions in the basement dining room in the lead-up to the People's Action Party's (PAP) inauguration. They became "key players in the politics of that era, and altered the destiny of the country". The house is thus notable for its rarity, said the report, as it is the only venue of discussions that led to the PAP's formation. Unionists and postal workers prepared posters and manifestos on the house verandah ahead of the PAP's first election in 1955, while the study was where Mr Lee worked on the contents of his iconic red box - a 14cm artefact holding his speeches, letters and readings throughout his political career. Former Malaysian prime minister Tunku Abdul Rahman was also hosted to dinner at 38, Oxley Road. By 1955, the home was the de facto PAP headquarters, according to Mr Lee's wife, the late Madam Kwa Geok Choo. Over time, it has become a symbolic landmark in depicting a cultural identity, or perpetuating a collective memory, said the report - its "architectural simplicity" standing for the values of frugality and discipline that the Lees exemplified in their public and private lives. In 1964, a police constable was found dead with a gunshot wound to his chest in an unoccupied house just behind Mr Lee's home, in a likely case of suicide. This house was absorbed to secure the back of Mr Lee's property. The bungalow is also notable for its authenticity, as no major structural changes were made in the past 30 years. It has unique local influences, setting it apart from the Anglo-Indian bungalow style introduced here by the British in the 1800s. 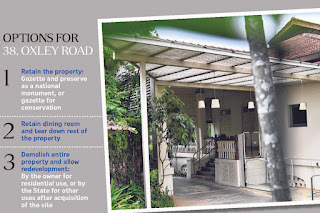 It can be classified as an "Anglo-Malay bungalow" that bears features borrowed from Malay architecture, such as elevation of the house above ground on arched masonry, said the NHB report. The first record of this new type of bungalow was in 1865. Was Lee Kuan Yew rushed into signing his last will?